At the center of this silver-toned, double-spiral crystal hanger is a gorgeous Tree of Life with crescent moon. Woven throughout the spirals are red, green and black beads. Silver-toned eternity knots dangle from the spirals branching off from the center tree and the attached loop makes hanging easy. 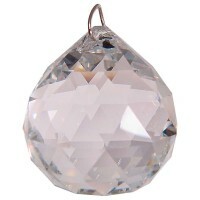 From the base hang a matching strand of beads and a stunning multi-faceted clear crystal sphere. 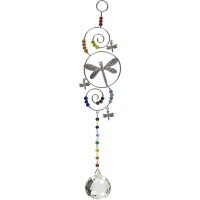 Crystal hangers add interest and sparkle to any home, patio or garden. Hang this gorgeous beaded wire and crystal prism indoors or out (recommended in a shaded, protected spot if hung outdoors). It is hand made in India and measures 12 inches long with attached loop for hanging. Item Number: KK-62916 | Approximate Size (Inches): 4.00 wide x 0.10 deep x 12.00 high | Approximate Shipping Weight: 0.50 lbs.